New: Before this debt exclusion, the YES campaign raised $20,325, 49% of it from school PTAs, and the vote is NO 40% and YES 60% on all 3 questions (below in dark blue; medium blue are the 3 individual questions; light blue is last year’s result) and NO 42% and YES 58% on all 3 questions (below in pink). Last year before the debt exclusion, the YES campaign raised $15,192, 41% of it from school PTAs, and the vote was NO 39% and YES 61%. If our Town leaders do some long-range planning — they don't for our operating and capital budgets —, they can extrapolate to see where this is going. 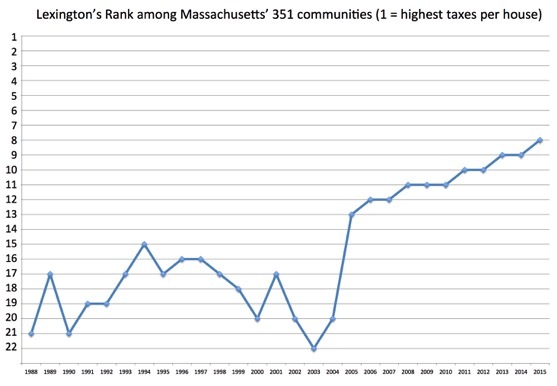 Also, 0% of our Selectmen, 0% of our School Committee, 0% of our Appropriation and Capital Expenditures Committees, 3% of Town Meeting and 40% of Lexingtonians opposed this debt exclusion — quite a disconnect between Town government and those it's supposed to represent. The YES campaign posted on its web site “A Rebuttal of Arguments from the No Campaign”. Read here why the YES campaign’s “rebuttal” is nothing of the sort; it only aims at confusing voters into voting YES for an unnecessary +3% tax increase on Dec 4. 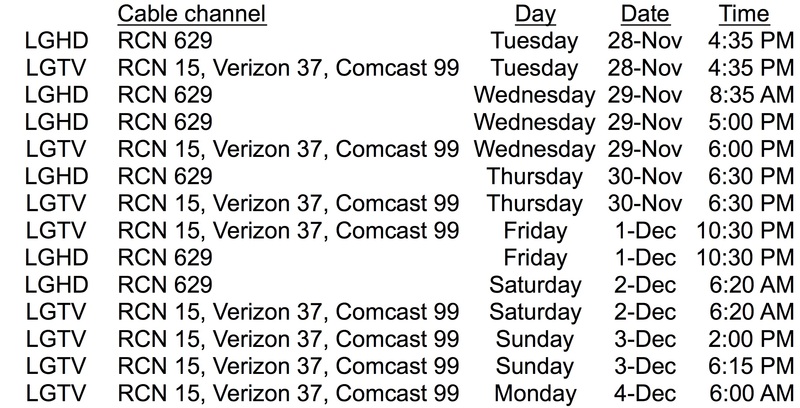 Watch at https://www.youtube.com/watch?v=2uXTdFu3R2I the 1-hour long LexMedia TV debate between the NO and YES campaigns moderated by Jim Shaw of the Colonial Times on Nov 17, 2017 (you can also watch the debate on cable TV at these times) and at https://videoplayer.telvue.com/player/c0gKv9ZUF0uiidDafFfESDZA5EkkJp7L/media/308495 the Dec 1st League of Women Voters’ First Friday conversation at Cary library between the NO and YES campaigns. On Monday, December 4, 2017, voters are asked to approve a tax increase to fund 3 projects (described here) costing $85.7 million: build a new Hastings school; build a pre-school on Pelham Rd; rebuild the main fire station. The ballot (which you received in the mail) will ask voters “Shall the Town of Lexington be allowed to exempt from the provisions of proposition two and one-half, so called, the amounts required to pay for the bonds issued in order to pay costs of design and construction for a new Maria Hastings Elementary School [...]” (emphasis added) and similar questions for the other 2 projects. The ballot questions do NOT ask voters whether they want these 3 projects done — we all do! But these 3 projects can be done and funded WITHIN the Town’s current budget, without any tax increase, as this web site demonstrates. 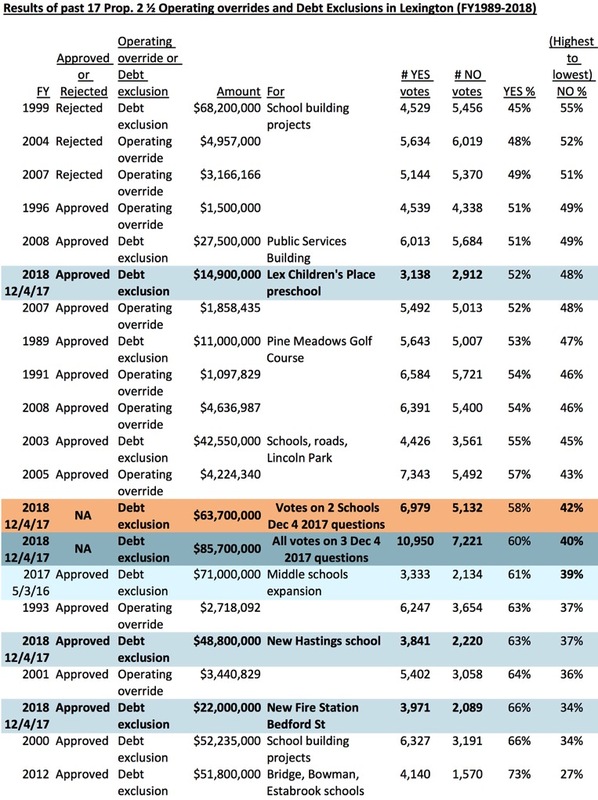 If voters approve the 3 questions, the Town will exclude the annual debt service of $6 million for the 3 projects’ $85.7 million cost from the Prop 2 1/2 limits on annual tax increases and all Lexingtonians will see a tax increase to pay for that $6 million amount over and beyond Prop 2 1/2. Because of debt exclusions and operating overrides, the taxes on a “typical” house in Lexington rose by +5.1% on average each year over 26 years (FYs 1990-2015), making Lexington less economically diverse. We support great schools and municipal services in Lexington, but we urge you to vote NO on December 4 because this +3% tax increase is unnecessary. The YES campaign’s belief (or voter scare tactic?) that “A “no” vote would mean rejecting this aid [...]” is unfounded: the Selectmen can ensure that we will receive the $16.5 million MSBA grant if the Hastings question fails by scheduling a Special Town Meeting before December 21 (120 days after the grant was awarded) to authorize the Hastings project on a non-exempt basis. The Town can and should save money and reduce the tax burden on seniors and the more financially vulnerable among us BEFORE it asks all taxpayers to pay more in taxes. --• move 3.2% of our elementary students to another school to better fill our elementary classrooms; this frees up 16 classroom spaces to accommodate our rising enrollments at no extra cost and saves about $2 million per year. --• like Concord, raise all employees’ salaries and reduce the Town's 85% contribution to our employees’ health premiums to 50%; our employees’ total comp stays intact and the Town saves about $2.5 million per year. 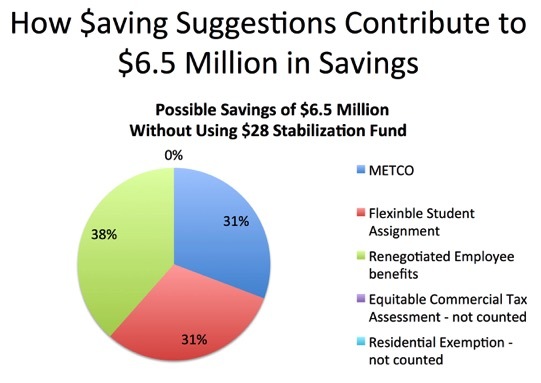 --• get the METCO sending communities and/or the State to reimburse Lexington for the full cost to educate the 243 METCO students now in our schools to save approximately $2 million per year. --• eliminating the multi-million dollar under-assessments of large office buildings and laboratories which give those commercial property owners unwarranted tax breaks; the resulting tax shift would reduce taxes on residential taxpayers and provide the Town with a few million dollars in new tax revenues each year. --• implementing a residential exemption to cut taxes on small homes (more likely owned by seniors and people with limited incomes) and raise taxes on larger houses. More than 13 years after a residential exemption was first proposed, the Selectmen are (finally...) looking into it. VOTE NO on December 4 to tell the Selectmen and the School Committee that they must save money and manage our finances more responsibly to keep Lexington diverse and affordable, instead of raising taxes yet again.